A behind-the-scenes look at how the tip line works and how successful it has already been at preventing tragedy in Maryland schools. REISTERSTOWN, Md. — "Classrooms should never be a place of fear," Gov. Larry Hogan said. Hogan announced his new initiative to make schools safer in October. Five months later, it's already working. "We've had a tip that went all the way down to law enforcement and an arrest was made so that's a good story," Maryland Center for School Safety executive director Kate Hession said. 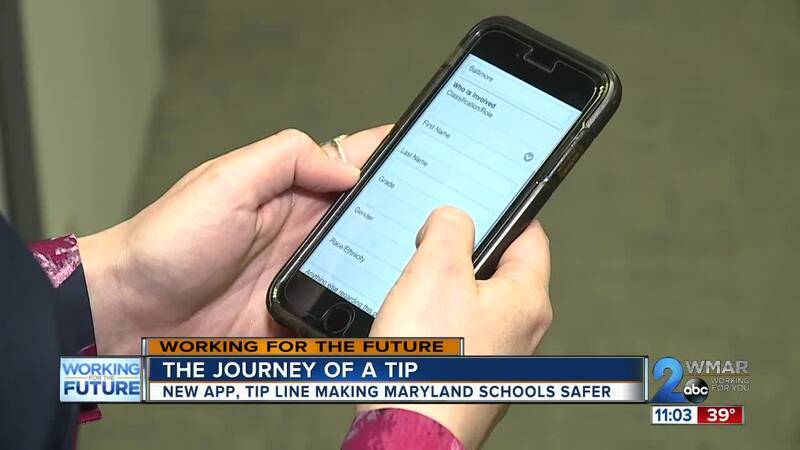 The tip line and Safe Schools Maryland app is a way for anyone; parents, students, community members, to report concerns easily and anonymously. "What they’ve found in a lot of these events that we’ve had, the previous events, is that somebody knew something prior to, let's say the school shooting, but they just either didn’t know how to tell something, who to tell or they were just scared," School safety analyst Sandy Caldwell said. The Maryland Center for School Safety oversees the program and partnered with the Maryland Emergency Management Agency, who mans the call center 24/7. So far, they have received 265 tips on things from drugs to planned school attacks and cyberbullying. "We had one where it was an actual threat of a fight," John Roush, the Director of Student and School Safety for Cecil County Public Schools, said. "We have a tool here that could save lives," Roush said. We decided to put the app and website to the test to see how easy they are to use. Because it's completely anonymous, all you have to do is create a 4-digit log in to submit a tip. Then you find your school, choose a type of report (theft, drugs, bullying, alcohol) and enter all the information you know (when/where it happened, who the victim or suspect is). You can also include a picture or video. Once you click submit, it is received at MEMA's Joint Operations Center instantly. "Once a tip is received, we are gonna check through everything to make sure that we have as much information as possible and also we can engage in dialogue with the tipster," MEMA's Response Coordination Branch Manager Kiona Black said. If there is an immediate threat, Black says they will call 911. With all tips, tip takers send the information to the school's designated recipients (principals, counselors, etc.) via text and email and the local law enforcement agency and emergency communications center. Roush is on the receiving end. He says they've handled 16 tips and they hope to get the word out so more people know how to submit them because they can save lives. "We've had a tip where kids threatened to harm themselves with cutting," Roush said. "These were cases where intervention was taking place with law enforcement coming into homes and doing wellness check and also one child was hospitalized." It's that quick response that shows the tip line can help. Roush also says it's not all about preventing tragedy, but easing minds. "It was perceived that a student made a threat to the school. They actually did some work with the school resources officer and the school administration. They actually figured out that it wasn’t a threat but perception in 9/10s of the law and kids were concerned about it." Roush said. "A number of tips come in for concerns about a social media threat. Those have actually gone down to local law enforcement. They’ve done investigations. Now none of those tips were deemed credible but there were obviously concerns from students and parents who thought that they were legitimate so just knowing that they were not is a good thing," Hession said. She emphasizes that this does not replace 911 during an emergency. She also says it's important that everyone knows they can submit a tip; parents, students, community members. "If you're at a local store or you’re at a park and you overhear something concerning but you’re not sure; you don’t know these kids. You don’t know what school they go to so you now have a resource," Hession said. They already have more than 1,800 Pre-K through 12th grade schools as partners and that includes all public schools. Private schools just have to fill out a quick form online to become part of the database and that just makes it easier for tip takers to connect with the schools to get them information fast. Right now, if a school isn't in the system, they have to look up contact information. The number of the tip line is 1-833-MDB-SAFE (1-833-632-7233).